Rate of Change : Time and Space in Electronic Art is an exhibition that looks back to the last decade of the 20th Century and Merce Cunningham’s experiments with digital media and dance, and places this masterwork in the context of inventive works creating in the last few years. 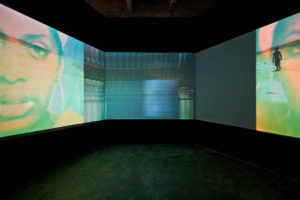 This exhibition is part of the 2009 New York Electronic Art Festival, and will run from September 29 to October 24 with an Artist Opening on October 1. 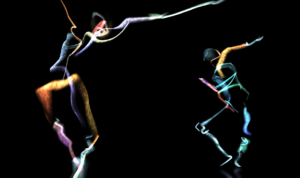 Hand-drawn Spaces (1998), a virtual dance installation by Merce Cunningham, Paul Kaiser, Shelley Eshkar and Ron Kuivila that presents a mental landscape in which motion-captured band-drawn figures perform intricate choreography in 3D. 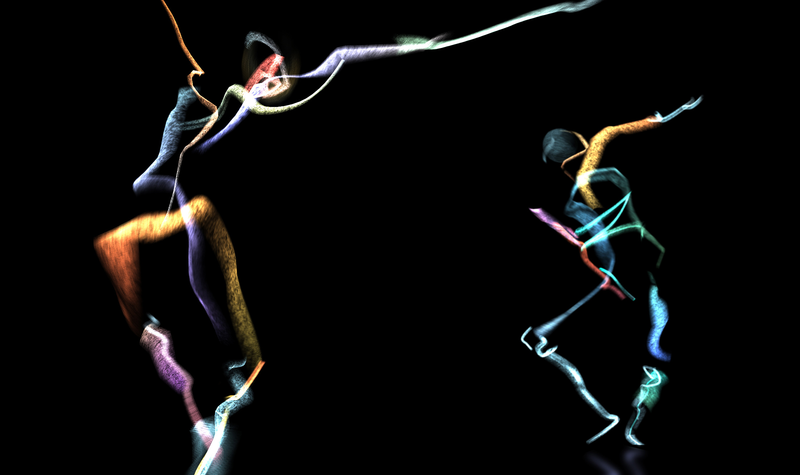 The virtual dancers appear as life-size drawings emerging from the darkness and moving in limitless three-dimensional space. 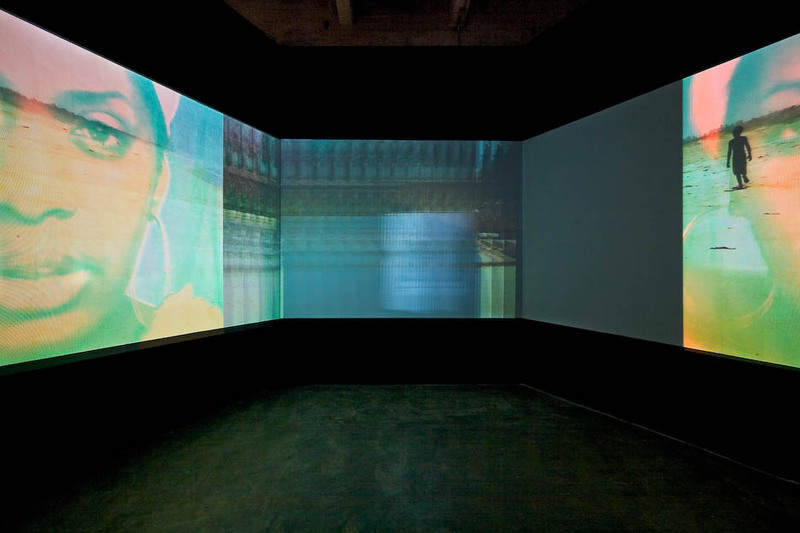 Though the dancers are visible on three screens, they move through a larger virtual area, and travel in and out of the projected image, often traversing the spectators’ space. 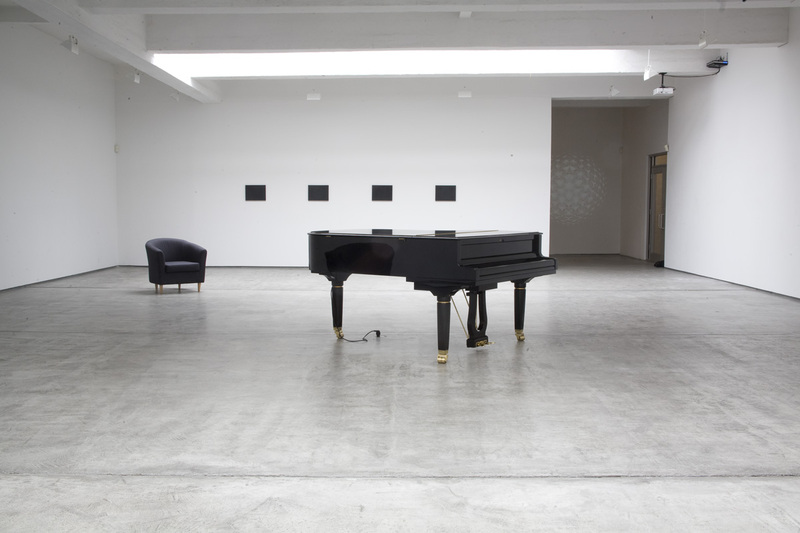 The spatial sound-score by Ron Kuivila evokes their positions in space, making their presences felt even when not seen. Paul Kaiser is a digital artist and writer whose work about mental space and drawing as performance became the points of departure for his solo and collaborative digital artworks since the mid-90s. Shelly Eshkar is a digital artist exploring drawing, computer graphics, and motion capture, a technology that digitally captures the movement, but not the physical likeness, of human motion. Eshkar and Kaiser are part of the OpenEnded Group (more info can be found at openendedgroup.com). Ron Kuivila gives concerts and makes installations with electronic instruments of his own design. Supported by the National Endowment for the Arts; American Masterpieces: Three Centuries of Artistic Genius. index V.4 is a site-specific installation by Céleste Boursier-Mougenot that translates fragments of language retrieved from internet chat rooms into a musical score playing in real-time by an acoustic piano placed in the gallery. The program isolates a set of notes, dynamics and other musical terms from the language retrieved to build its ongoing score. Céleste Boursier-Mougenot lives and works in Sète, France. His work merges the realms of the musical and the visual, mining unexpected sources for their musical potential and creating situations or devices in which sonic events get expressed visually or visual information gets expressed sonically. Calling on ideas about technological productions, language, chance operations and systems of translation, Boursier-Mougenot’s work converges multi-sensory phenomena with a cerebral investigation of the mechanisms of sight and sound in his given situations. Production by superposition. Co-production by Théâtre de Gennevilliers with the support of DICREAM (Ministry of Culture and Communication and the Renos Xippas Gallery). Computer programming: Oussama Mubarak – Paris. Special Thanks to Hugues de Saint Simon (Cité de la Musique, Paris). index V.4 is presented in New York in collaboration with superposition and Les Pianos Pleyel. Additional support by Etant donnés: The French-American Fund for Contemporary Art. Orbital Drop (Lander) by CCRT is a hypothetical space probe, flung to the furthest reaches of space to observe and transmit information and images from alien worlds while performing scientific research. 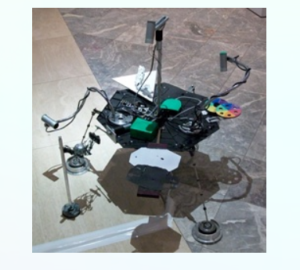 Inspired by the use of color correction panels and sundials on many robotic spacecraft, CCRT has built an idealized spacecraft laboratory that gathers data about its environment by performing experiments using self-contained devices. Feeds from seven cameras monitoring the experiments are beamed back to the base station for display and analysis. Tali Hinkis, Kyle Lapidus, and Douglas Repetto are CCRT, a New York-based collaboration that begun with their common interests in the relationship of science, technology, and art. In this collaboration they explore the processes of interpretation and evaluation that are inherent in human attempts to understand natural phenomena. They have exhibited work at The New York Electronic Art Festival, free103point9’s Transmission Sculpture Park, and turbulance.org. A Harvestworks Sponsored Project funded by the Greenwall Foundation. Shock and Allah by Julia Heyward is an interactive installation that meditates on the cyclical nature and dualities of life through faux-windows scenes of feeding frenzies, and alien invasion, a crucifixion, and real life army maneuvers. These windows’ outdoor scenes are layered with internal domestic scenes seen nightly in the reflections of the window panes. The windows have movement sensors and a camera as input modules that trigger changes in the window scenarios. This project was commissioned by Harvestworks with public funds from the New York State Council on the Arts. 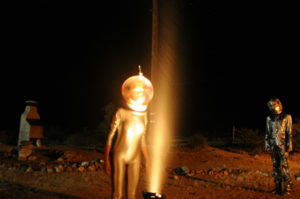 Julia Heyward began her career as a solo performance artist touring America and Europe throughout the 1970s with work that incorporated video, film, monologues and a cappella singing. She has received a John Simon Guggenheim Foundation Fellowship and grants from the Rockefeller Foundation, the National Endowment for the Arts, and the New York State Council on the Arts. Collective by Hisao Ihara is a digital moving collage of an ever-shifting panorama of images that will give the audience a sense of collective memory. Hisao Ihara is a digital media artist born in Tokyo and based in New York City. 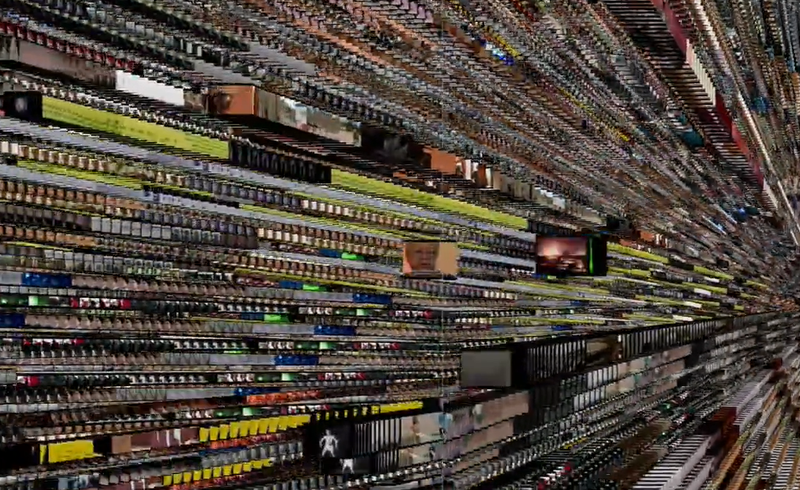 His work explores the intricate overlay of time and visual perception within immersive video environments. Ihara holds a BFA from the Cornish College of the Arts and an MFA from Alfred University. He has received fellowships from the New York Foundation of the Arts and the New York State Council on the Arts. Rituals of Consumption by Jessica Ann Peavy is a three-channel experimental video work exploring the spaces and contexts of food in the African-American tradition and the effects of food on the African-American female psychology and physiology. This body of work consists of a public performance, video installations, and animations. Jessica Ann Peavy was born in Columbus, Ohio and now currently lives and works in New York City. She received her BFA from Tisch School of the Arts at New York University and completed an MFA in photography, video, and related media at the School of Visual Arts. Peavy recently received residencies at Smack Mellon and Harvestworks and grants from Franklin Furnace and the New York State Council of the Arts. 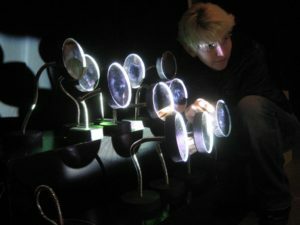 Decrypted Reflections by Christine Sugrue is an interactive installation that explores light, space, and generative systems. The interface for the work is an analog system of mirrors that allows the visitor to manipulate the projected image, moving its broken pieces to create new structures, or explore the original form. Christine Sugrue is an artist and programmer working with interactive installations and audio-visual performance. She has been an artist in residence at La Casa de Velázquez, Madrid, Hangar, Barcelona, Harvestworks and Eyebeam, NYC. See more at csugrue.com. Future Creatures by Eunjung Hwang is a two-channel video work of experimental animations that explores the complexity of cryptic images from the world of dreams and the subconscious. Visionary narratives inspired by the illusion of fragmented realities are compiled into a usable pictorial catalogue. The resulting project is a kaleidoscopic moving “puzzle” of “thought picture” that generates its own symbolism. Eunjung Hwang was born in Seoul, Korea. 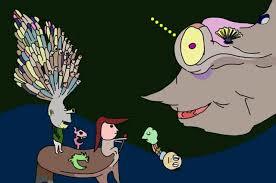 Her animations and new media works have been featured in exhibitions and festivals internationally. She was a resident fellow at Akademie Schloss Solitude, Germany (2008-09) and the Künstlerhaus Büchsenhausen, Innsbruck/Austria (2005).